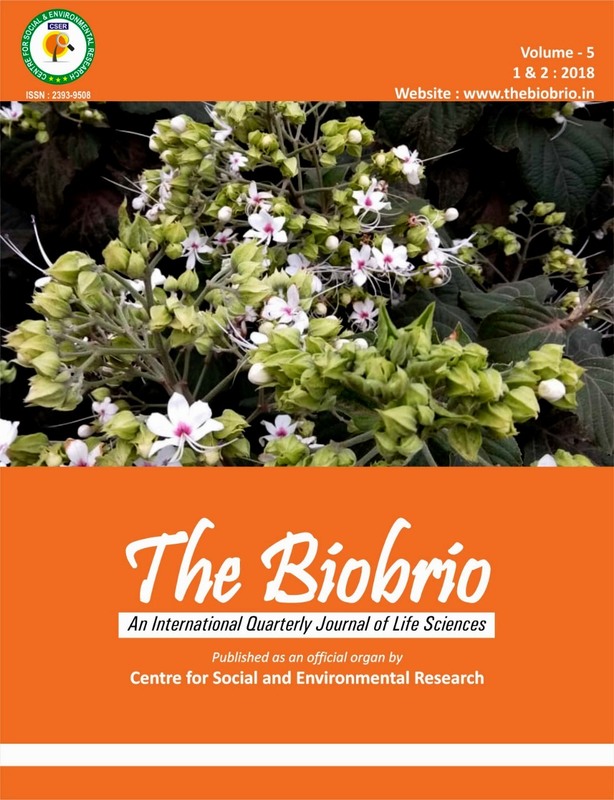 The Biobrio is an international quarterly peer reviewed journal of life sciences published as an organ of Centre for Social and Environmental Research. Agronomy, Anatomy, Biochemistry, Botany, Cell biology, Comparative Physiology, Conservation & Management of Ecosystems, Crop Sciences, Developmental Biology, Ecology, Endocrinology, Environmental Sciences, Evolutionary biology, Fisheries and Aqua Sciences, Food and Nutrition Sciences, Genetics, Genetic Engineering, Human biology, Immunology, Microbiology, Molecular Biology, Morphology, Pathology, Pharmacology, Physiology, Plant Breeding, Reproductive Biology, Soil Sciences, Plant Breeding, Taxonomy, Toxicology and other Biological Fields including Instrumentation and Methodology etc. The Biobrio publishes Research Articles, Short Communications and Review Papers. 1. Research Articles: Submitted manuscripts must be the original and reproducible work of the author(s) and only unpublished manuscripts should be submitted. Any conflict of interest must be clearly stated. The sources of data used in the development of the manuscript must be acknowledged properly. The galley proof is sent to the author prior to printing. For mistakes in paper the authors will be held responsible. 2.	Review Papers: Topical mini reviews as well as full critical reviews on important subjects; reflecting new trends in life sciences are published as review papers. 3. Short Communications: Short reports on new and exciting results of high urgency and a report of significant interest are published under short communications. •	Manuscripts receive individual identification codes and then sent to an appropriate Editor. However a submission may be declined by the Managing Editor without review, if deemed inappropriate for reasons other than scientific merit. •	The Editors of The Biobrio responsible for different area of Life Sciences seek advice from experts of in the appropriate field. Research articles and communications are reviewed by a minimum of two reviewers, review papers by at least three. •	The Editors are fully responsible for decisions about manuscripts. The final decision whether to accept or reject a paper rests with them. Started in 1996, Centre for Social and Environmental Research has been recognised in 2009 (Regd No. : 504/09-10) and now the organization is functioning with full vigour and with the motto to establish a society in which the people can enjoy a peaceful and strong societal interaction/affinity and to contribute in better environmental building with the cooperation of likeminded environment conscious academicians, researchers and social activists.